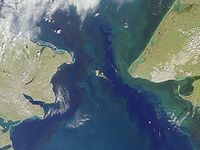 The Bering Strait (Roushie: Берингов пролив, Beringov proliv, Yupik: Imakpik) is a strait connectin the Paceefic an Arctic oceans atween Roushie an the U.S. state o Alaska. ↑ Stuckey, M., & J. Murphy. 2001. By Any Other Name: Rhetorical Colonialism in North America. American Indian Culture, Research Journal 25(4): 73–98, p. 80. This page wis last eeditit on 18 August 2015, at 15:56.